It's official! 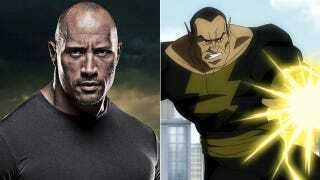 Dwayne Johnson has announced he will be playing Shazam's foe Black Adam and not the hero himself in Warner Bros.' upcoming Shazam movie. Weird. I have to imagine WB would havep referred the extremely bankable star to have been the titular hero of the movie, and thus the face of the potentially long-running franchise, but as we've all acknowledged it's not like The Rock isn't perfect for this role, too. But now who the hell are they going to find to fill Shazam's cape? Who has the massive build and boyish charm to play an 11-year-old trapped in an adult superhero's body besides Dwayne Johnson? Any suggestions?